One of the key trends in the new Econsultancy E-commerce Platforms Guide is that of a marked integration between social media and the e-commerce environment. Social media has long been a strategic element within online retailing, long before the marketing term for this activity became fashionable. But which is best: using social media to help you sell, or solely relying on selling through social media? A recent article on AdAge caught my eye which explores this, by considering the potential rise of “f-commerce”, or in other words, Facebook commerce. It’s hard to not appreciate the commercial nature of Facebook. (In fact, it’s something we’ve covered a lot). With over 400m active users, there’s a lot of money to be made and the site is probing ways to exploit this. Only a few weeks ago, various reports were circulating that the company generated $635m during 2009 and could well be on track to make over a billion dollars by the end of this year. Astonishingly, some analysts are now predicting the company to be worth $35bn. Although I think this may be a little bullish at the moment, it’s easy to see why. Consider the opportunities; Facebook relies heavily on display advertising, which it recently announced it would be refining, sending out signals that it’s serious about increasing revenues. Furthermore, the internet is buzzing with the site’s suggestion that it’s considering passing across personal data to select third-parties in order to create a more “personalised” experience. However, this is a slightly separate issue to Facebook actually turning itself into an e-commerce platform of sorts – the fact that Facebook partnered itself with PayPal last year is perhaps more telling or its e-commerce ambitions. Interestingly, Facebook doesn’t currently take commission from any physical e-commerce sales made on-site, but it does collect 30% on purchases of virtual goods, which is estimated to be worth some $5bn annually. Yet, this may change in the very near future, especially as the likes of Real Gifts emerge. (Real Gifts is a startup that pretty much delivers what its name suggests and claims to already have had “significant interest from big brands”). However, it’s the new Facebook app SocialShop from BigCommerce which really gives a clue as to the direction the site is steering towards. So now it’s possible for organisations with fan pages to display and sell products via Facebook. Admittedly, the transaction isn’t yet done through the site, but I imagine it’s genuinely not far off. 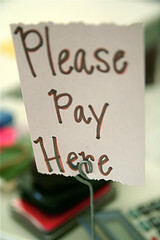 Already, Payvement has used PayPal’s API to create an application that allows anyone to build an e-commerce storefront. Consequently, the sheer scale and weight that can potentially be leveraged through ‘f-commerce’ is pretty exciting. Companies are already experimenting in this arena and the results are positive. By adding e-commerce functionality to Facebook, or even building an e-commerce platform into the site itself, I’m expecting to see a very real, very fast uptake amongst both consumers and retailers alike. I’d also argue that it makes sense this will probably more happen than not, as everyone benefits. Consumers are given the option of purchasing through an extra channel and retailers are given the option of having an extra channel to sell through, to relevant customers. It’s well noted that the biggest challenges this supersite faces will be retaining its astronomic user-base, along with turning a profit, and ‘f-commerce’ has the potential to provide extra revenue streams for the site. 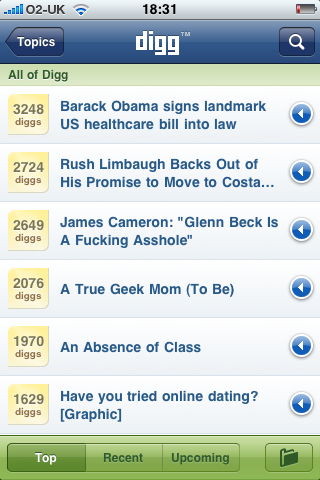 The Digg app for the iPhone was released yesterday, which allows mobile users to browse content and vote on stories, as on the main site.